Series# UL1061-22-XXTP1-0500. PVC Insulated UL1061 CSA SR-PVC 22 AWG (7/30) hook up wire on a 500' spool; Twisted Pair Wire, 2 Twists Per Inch (TPI). Just choose 2 of the 10 standard colors available! Series# UL1007-18-XXTP1-0250. PVC Insulated UL1007 UL1569 CSA-TR64 18 AWG (16/30) hook up wire on a 250' spool; Twisted Pair Wire, 1 Twist Per Inch (TPI). Pick your colors! Series# UL1007-26-XXTP1-1000. PVC Insulated UL1007 UL1569 CSA-TR64 26 AWG (7/34) hook up wire on a 1000' spool; Twisted Pair Wire, 1 Twist Per Inch (TPI). Pick your colors! Series# UL1007-24-XXTP1-1000. PVC Insulated UL1007 UL1569 CSA-TR64 24 AWG (7/32) hook up wire on a 1000' spool; Twisted Pair Wire, 1 Twist Per Inch (TPI). Pick your colors! Series# UL1061-22-XXXTT1-0250. PVC Insulated UL1061 CSA SR-PVC 22 AWG (7/30) hook up wire on a 250' spool; Twisted Pair Wire, 2 Twists Per Inch (TPI). Just choose 3 of the 10 standard colors available! Series# UL1007-22-XXTP1-1000. PVC Insulated UL1007 UL1569 CSA-TR64 22 AWG (7/30) hook up wire on a 1000' spool; Twisted Pair Wire, 1 Twist Per Inch (TPI). Pick your colors! Series# UL1007-18-XXTP1-0500. PVC Insulated UL1007 UL1569 CSA-TR64 18 AWG (16/30) hook up wire on a 500' spool; Twisted Pair Wire, 1 Twist Per Inch (TPI). Pick your colors! Series# UL1007-22-XXTP2-1000. PVC Insulated UL1007 UL1569 CSA-TR64 22 AWG (7/30) hook up wire on a 1000' spool; Twisted Pair Wire, 2 Twists Per Inch (TPI). Pick your colors! Series# UL1061-24-XXTP1-1000. PVC Insulated UL1061 CSA SR-PVC 24 AWG (7/32) hook up wire on a 1000' spool; Twisted Pair Wire, 1 Twist Per Inch (TPI). Just choose 2 of the 10 standard colors available! Series# UL1061-24-XXTP2-1000. PVC Insulated UL1061 CSA SR-PVC 24 AWG (7/32) hook up wire on a 1000' spool; Twisted Pair Wire, 2 Twists Per Inch (TPI). Just choose 2 of the 10 standard colors available! Series# UL1061-18-XXTP1-0500. PVC Insulated UL1061 CSA SR-PVC 18 AWG (16/30) hook up wire on a 500' spool; Twisted Pair Wire, 1 Twist Per Inch (TPI). Just choose 2 of the 10 standard colors available! Series# UL1061-22-XXTP1-1000. PVC Insulated UL1061 CSA SR-PVC 22 AWG (7/30) hook up wire on a 1000' spool; Twisted Pair Wire, 2 Twists Per Inch (TPI). Just choose 2 of the 10 standard colors available! Series# UL1007-20-XXTP1-1000. PVC Insulated UL1007 UL1569 CSA-TR64 20 AWG (10/30) hook up wire on a 1000' spool; Twisted Pair Wire, 1 Twist Per Inch (TPI). Pick your colors! Series# UL1007-14-XXTP1-0250. PVC Insulated UL1007 UL1569 CSA-TR64 14 AWG (41/30) hook up wire on a 250' spool; Twisted Pair Wire, 1 Twist Per Inch (TPI). Pick your colors! Series# UL1061-18-XXTP2-0500. PVC Insulated UL1061 CSA SR-PVC 18 AWG (16/30) hook up wire on a 500' spool; Twisted Pair Wire, 2 Twists Per Inch (TPI). Just choose 2 of the 10 standard colors available! Series# UL1061-24-XSXSTP2-1000. 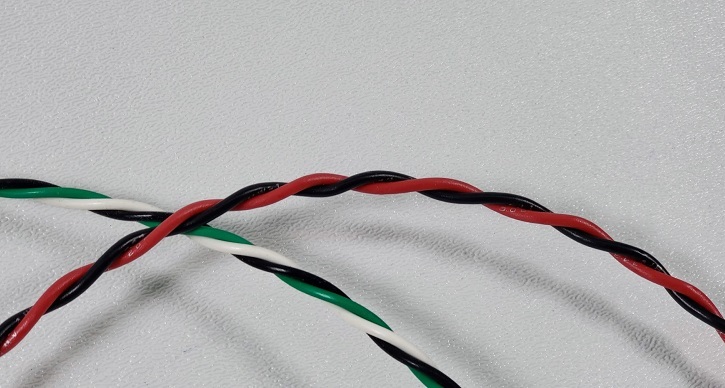 PVC Insulated UL1061 CSA SR-PVC 24 AWG (7/32) hook up wire on a 1000' spool; Twisted Pair Wire, each with Stripe, 2 Twists Per Inch (TPI). Just choose your base and stripe colors! Series# UL1007-16-XXTP1-0500. PVC Insulated UL1007 UL1569 CSA-TR64 16 AWG (26/30) hook up wire on a 500' spool; Twisted Pair Wire, 1 Twist Per Inch (TPI). Pick your colors! Series# E-26(19)-XXTP3-0500. Type UL1213 MIL-W-16878/4 Teflon insulated 26 AWG (19/38) hook up wire on a 500' spool; Twisted Pair Wire, 3 Twists Per Inch (TPI). Just choose 2 of the 10 standard colors available! Series# E-26(19)-XXSTP3-0500. Type UL1213 MIL-W-16878/4 Teflon insulated 26 AWG (19/38) hook up wire on a 500' spool; Twisted Pair Wire, Second Wire Striped, 3 Twists Per Inch (TPI). Just choose 2 of the 10 standard colors available! Series# UL1007-18-XXTP1-1000. PVC Insulated UL1007 UL1569 CSA-TR64 18 AWG (16/30) hook up wire on a 1000' spool; Twisted Pair Wire, 1 Twist Per Inch (TPI). Pick your colors! Series# UL1061-18-XXTP1-1000. PVC Insulated UL1061 CSA SR-PVC 18 AWG (16/30) hook up wire on a 1000' spool; Twisted Pair Wire, 1 Twist Per Inch (TPI). Just choose 2 of the 10 standard colors available!